The pomp and ceremony surrounding the funeral of Richard III in Leicester this week, and the pageantry at the field of Bosworth captivated the imagination of many people throughout the English Midlands at the weekend. It reaches its climax when Richard III is buried in Leicester Cathedral on Thursday [26 March 2015], almost 530 years after his death on the battlefield in 1485. His skeletal remains were found three years ago  beneath a car park in Leicester within the grounds of the former Greyfriars Friary Church. The Battle of Bosworth in 1485 brought an end to the War of Roses, and the discovery prompted many new books, journal papers and television documentaries on Richard III and the Plantagenets. But this week’s ceremonies and public displays also left me wondering how the ‘Bosworth Crucifix,’ which many have been part of Richard III’s battlefield chapel, came into the possession of the Comerford family almost 200 years ago. 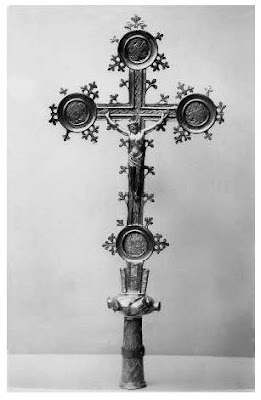 ‘The Bosworth Crucifix’ which once belonged to the Victorian book collector, antiquarian and notary, James Comerford (1807-1881). It now belongs to the Society of Antiquaries in London, and featured prominently in the exhibition ‘Making History’ (2008-2009). The Bosworth Crucifix, dating from the 15th century, is said to have been discovered around 1778 at or near the site of Battle of Bosworth. The Battle of Bosworth was fought on fields several miles south of Market Bosworth, Leicestershire, on the morning of 22 August 1485, by two armies led by King Richard III and the Lancastrian pretender, Henry Tudor, who became Henry VII. It was the last significant battle in the War of the Roses, and the last battle in which an English king died on the battlefield. It has since become one of the most legendary battles in English history. The Canadian journalist and author Thomas B Costain, in The Last Plantagenets (1962), argued that that Richard III was a great monarch who has been tarred by conspiracies, after his death, with the murder of the princes in the tower. Costain, who supported his theories with documentation, suggested that the real murderer was the victorious Henry VII. This 15th-century bronze processional crucifix measures 58.5 cm x 28 cm (23 in x 11 in). It is made of bronze alloy and would have been originally overlaid with gold. It has an outer frame forming a foliated border, damaged at each extremity of the transverse limb of the cross. At its centre is the figure of the Crucified Christ, crudely cast in a bronze alloy. A mark at the crown of the head indicates that a nimbus was once attached to Christ’s head. Each arm of the crucifix ends with a roundel, decorated on the front with the symbols of the four evangelists, and probably covered with idl. From the viewer’s perspective, these symbols are arranged as follows: at the top, an eagle (Saint John); at the bottom, a winged man (Saint Matthew); to the left, a winged lion (Saint Mark); and to the right, a winged bull (Saint Luke). On the back, the roundels are decorated with what appear to be suns or stars, with rays streaming from them, and the familiar sunburst emblem of Edward IV and the House of York. Additional branches may have carried figures of the Virgin Mary and Saint John. Attachments for these additional branches can be seen at the base of the cross, although the branches themselves are now missing. Philip Schwyzer suggests in his recent book Shakespeare and the remains of Richard III (Oxford University Press, 2013) that the cross belonged to a travelling chapel royal, and that it was lost and abandoned in the chaos after the battle. Chris Skidmore in Bosworth: the Birth of the Tudors (Hachette, 2013) suggests the crucifix was used during a private Mass for King Richard III before the Battle of Bosworth. After that Mass, the cross would have been taken off its base, mounted upon a wooden stave, and fastened into place by a hinged ring of iron to be led into the field of battle. The crucifix was discovered around 1778 near the supposed site of the battlefield, but perhaps at Husbands Bosworth in south Leicestershire, about 18 miles south-east of the battlefield and east of Coventry. Soon after its discovery, it came into the possession of a woman who has been named as Lady Fortescue. In his paper on ‘The Bosworth Crucifix’ in the Transactions of the Leicestershire Archaeological and Historical Society (no 78, 2004), John Ashdown-Hill, who specialises in the life of Richard III, wonders whether this Lady Fortescue may have been Lady Barbara Talbot who in 1780 married Francis Fortescue-Turville of the Manor of Husbands Bosworth. 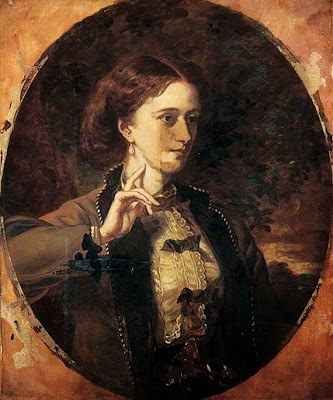 She was a sister of Charles Talbot (1753-1827), 15th Earl of Shrewsbury (1787-1827), and an aunt of John Talbot (1791–1852), 16th Earl of Shrewsbury (1827-1852) and patron of the Gothic revival architect AWM Pugin. Lady Fortescue, or Lady Barbara Fortescue-Turville, was originally from Hoar Cross, Yoxall, about 12 km north of Lichfield and 30 km north of the Bosworth battlefield. She is said to have given the crucifix to one of her workers, John Brown, who owned the crucifix when he died in 1791 ... perhaps the same John Brown of Kenilworth whose will was proved in the Consistory Court of Lichfield in 1793, although this will does not mention the crucifix. The crucifix and many other Catholic relics passed from John Brown to Joseph Carter, the sexton of Saint Michael’s Church, Coventry (later Coventry Cathedral) by 1793. Joseph Carter had married Elizabeth Brown in Saint Michael’s Church, Coventry, in 1778, and she may have been related to John Brown. He died in June 1808, and his will was granted administration in the Consistory Court of the Diocese of Lichfield on 7 October 1808. The crucifix then passed to his widow Elizabeth Carter and remained with the Carter family of Saint Michael’s Parish, Coventry. Presumably it was she who sold it to the Comerford family – probably James Comerford’s father – ca 1808-1810. However, it is still unclear how the crucifix passed from the Brown family to the Carter family and from the Carter family to the Comerford family. The Bosworth Crucifix was owned by the family of the antiquarian and book collector James Comerford from around 1810. James Comerford was born in Holborn in 1807, probably the son of James Comerford, a Notary Public of Change Alley in Cornhill, London, who died on 11 August 1833. He appears to have been of Irish descent, although Ashworth-Hill, in his paper on the Bosworth Crucifix, wonders whether James was related to the Comerford family who lived in Saint Michael’s Parish in Coventry in the first half of the 19th century. James Comerford first practised as a notary public in partnership with TS Girdler as Comerford and Company at 27 Change Alley, Cornhill, London, from December 1827. Later, he practised from 7 Tokenhouse Yard, Lothbury, London. He was also a magistrate or Justice of the Peace (JP). In 1833, James Comerford was secretary to the Society of Public Notaries of London. In December 1840, he was elected a Fellow of the Society of Antiquarians (FSA). Between 1841 and 1851, James Comerford and his family were living at No 7 Saint Andrew’s Place, Regent’s Park, London. By 1872, he was living in Framfield, Sussex. He died on 8 March 1881. He had a daughter, and a son, James W. Comerford, who shared many of his antiquarian interests. James Comerford is best remembered as a book collector and antiquarian. He amassed a library that included a large collection of county histories, local topographies and books of Catholic religious piety. His heraldic bookplates, with the motto So Ho Ho Dea Ne, are much sought-after collectors’ items. After his death, Sotheby’s sold his library at auction on 16-20 November 1881, realising a sale total of £8,372 13 s. His books occasionally come back on the market, but more often they are valued for his heraldic bookplates than as antique books. 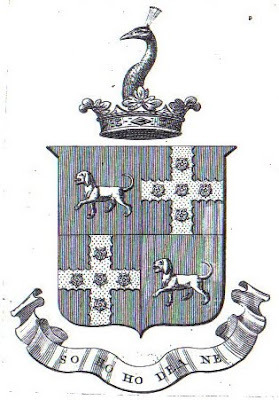 In his bookplates, James Comerford of London also continued the tradition within the Comerford family of Ireland of claiming the Combeford arms. These claims were also advanced by my great-grandfather James Comerford (1817-1902), who visited Comberford Hall, the Moat House, Tamworth, about 12 miles from the site of the Battle of Bosworth, and Wednesbury ca 1900-1902, and described himself as a descendant of the Comberford family. He adapted the same bookplate when he privately published his personal account of the Comerford family and that visit the ancestral homes of the Comberford family of Staffordshire shortly before his death. Shortly after the account of his visit was printed and bound, James Comerford added his bookplate and additional handwritten notes to the slim volume. 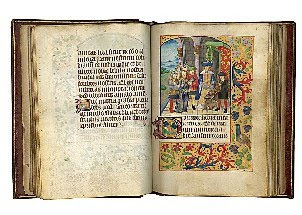 The surviving copy of this small book is in the local history collection at Tamworth Library, Corporation Street, Tamworth (open shelves, T/COM), with a pencilled page of notes recording the details of his visit. The Bosworth Crucifix is an important historical English artefact, and may have been one of the inspirations for the Crucifix on the reredos in the Church of the Holy Angels in Hoar Cross, built in the 1870s by the Hon Emily Charlotte Meynell Ingram, who, like Lady Barbara Fortescue-Turville, had lived at Hoar Cross Hall. But as well as being an important historical English artefact and an interesting glimpse into the piety of Richard III, the Bosworth Crucifix is also a stark reminder of the meaning as the Cross as we move in these next few days through Passiontide and towards Good Friday next week. For my reflections and devotions each day during Lent this year, I am reflecting on and invite you to listen to a piece of music or a hymn set to a tune by the great English composer, Ralph Vaughan Williams (1872-1958). Yesterday [22 March 2015], I was listening to the hymn ‘Come down, O love divine’ for which Vaughan Williams wrote the tune ‘Down Ampey,’ named by Vaughan Williams after the pretty Cotswold village in Gloucestershire where he was born in the Vicarage on 12 October 1872. This is, perhaps, the most famous of all the local wassail traditions. ‘Wassail’ is an ancient toast meaning something like ‘Good health!’ It is also refers to a mulled cider that was part of ‘wassailing’ festivities, typically on the Twelfth Night of Christmas. To this day, the practice of wassailing survives as a folk tradition in many parts of England. ‘The Wassail Song’ (1913) comes long after Vaughan Williams had edited of the English Hymnal (1906). The intervening seven years were marked by intense activity, and in the end Vaughan Williams was to gather more than 800 songs and variant versions. ‘The Wassail Song’ grew out of these collecting efforts. He published his arrangement of the tune he had gathered as the last in a collection of folk song settings, the Five English Folk Songs, in 1913. The other four songs are ‘The Dark-Eyed Sailor,’ ‘The Springtime of the Year’, ‘Just as the Tide was Flowing,’ and ‘The Lover’s Ghost.’ Vaughan Williams turned to folk song for inspiration throughout f his career, but these five arrangements are often considered his best. Certainly they are the most elaborate, with the material treated freely throughout. This morning’s is sometimes called ‘The Gloucestershire Wassail’ to distinguish it from ‘The Somerset Wassail.’ The best-known ‘Wassail’ song today, however, is ‘Here we come a wassailing among the leaves so green,’ which comes from Yorkshire. Many versions of wassail songs have been recorded by English folk groups, including Steeleye Span and Maddy Prior and the Carnival Band. ‘The Gloucestershire Wassail’ appears in both the original Oxford Book of Carols (1928), for which Vaughan Williams was one of the editors, and the New Oxford Book of Carols (1992). Vaughan Williams’s setting has kept alive ‘The Gloucester Wassail,’ which can be traced back to at least the 18th century. It is one of many songs celebrating the tradition of ‘wassailing’ from door to door, when singers are offered drink in thanks for their singing. For his setting of ‘The Wassail Song,’ Vaughan Williams selected six of the eight verses, leaving out most of the references to specific barnyard animals. For example, the “ox” Vaughan Williams refers to is first a horse, Dobbin, and then two cows, Broad May and Colly, in the original. When the song refers to “our bread it is white,” it is worth remembering that at one time white bread was not regarded as providing poor nutritional value or bland taste and a texture lacking in appealing texture, but was seen a delicacy enjoyed by the well-to-do. Vaughan Williams begins the arrangement with a haunting introduction. Although the tune itself opens with a rising fourth (E–A), he commences with a series of rising fifths and then fourths (A–E at first and only then E–A), generating the hollow, ancient sound of harmony without thirds. He creates rhythmic tension by first following the proper stress emphasis of the word ‘Wassail,’ presenting it as expected on the upbeat, and then going against this by placing it on the downbeat, which can throw choruses off in rehearsals. Only after all voices have entered can the tenors bring forth the tune itself, eventually handed about to other parts as well. Throughout the work, dynamics are of special importance, for if properly followed the impression Vaughan Williams creates is that of singers approaching from afar, eventually singing full force when they are nearest to the listener, and then fading away as they head off into the distance, ending with the altos alone on a ppp rising fifth. One of the last major pieces he wrote was the spectacular Hodie for chorus, soloists, and orchestra, completed in his 82nd year. In the Wassail bowl we’ll drink unto thee. A good Christmas pie as e’er I did see. In the Wassail bowl we'll drink unto thee. May the Devil take butler, bowl and all! For to let these jolly Wassailers walk in.